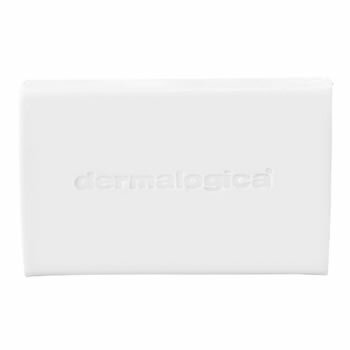 The performance of a Dermalogica Cleanser in a convenient bar form. This soap-free, convenient bar removes impurities and breaks down surface oils without stripping the skin's natural moisture barrier. Lather in hands with warm water. Work over face and throat, then rinse. Repeat for double clean benefits. Acid-balanced, non-drying and nonirritating to help keep skin hydrated. Travels easily in a gym or travel bag. Anti-inflammatory agents help soothe and condition, preparing skin for a closer shave with minimized irritation. Hydroxy acids gently exfoliate for smoother, softer skin. Colloidal Oatmeal, Glycyrrhiza Glabra (Licorice) Extract and Allantoin: help soothe skin. Lactic Acid, Avena Sativa (Oat) Kernel Flour and Retinol (Vitamin A): help smooth and exfoliate. Melaleuca Alternifolia (Tea Tree) and Lavandula Angustifolia (Lavender): extracts that help maintain bar purity during use.